I don’t know one person who doesn’t love a Ferrer Rocher. They have always been a weakness for me, the classic delicacy, and its timeless elegance but unfortunately not filled with the best ingredients. So of course I found a way to make them using delish wholesome ingredients. I beatified up these bad boys. They are full of raw cacao, good fats and ZERO refined sugar. They’re a healthy and indulgent treat with all the flavour and texture of the traditional Ferrero Rocher without all the processed ingredients and refined sugars. So you can thank me later! You can feel good putting these ingredients into your body and enjoy your treat without the guilt. Give them a try and I promise you will fall in love with them MORE than the original!! Add all ingredients into a food processor. Pulse until a crumble consistency forms. 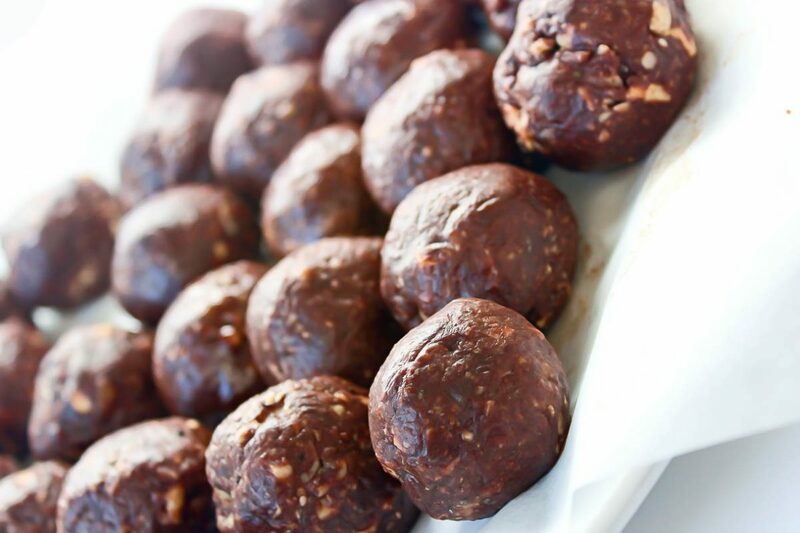 Using a tablespoon scoop and roll into balls. These are great to keep in the fridge or freezer. I prefer freezer and grab when I’m hungry!